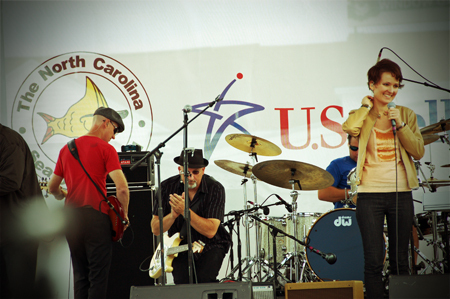 August 19, 2012 – Ginger Garner will be performing with her band at the Pavilion in downtown Swansboro, NC on August 19th. A free concert as part of the 2012 SwanFest Concert Music Series, bring your lawnchairs and pack a picnic to enjoy the sights and sounds of music by the waterfront. Ginger will be accompanied by the incredible talent of veteran jazz drummer Glenn Pointe, who has toured and shared the stage with R&B, soul, and jazz legends from Screamin’ Jay Hawkins to Ella Fitzgerald; Mark Hibbs, longtime blues guitarist and current bassist in the band PTM, and Jeff Jablonski, veteran bassist who has over the past 25+ years played in venues from ranging from the famous 9:30 club in D.C. to the Seafood Festival right here in Morehead City, NC. The lineup of tunes Ginger has selected for this free concert will include a happy mix of uplifting soul, blues, folk, and gospel music that highlights the struggles and triumphs of Americans throughout history. It’s sure to leave you with lots of smiles.